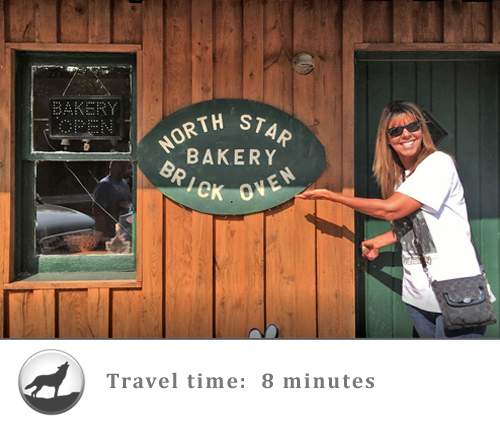 Our location makes it easy to visit a multitude of incredible Upper Peninsula attractions. 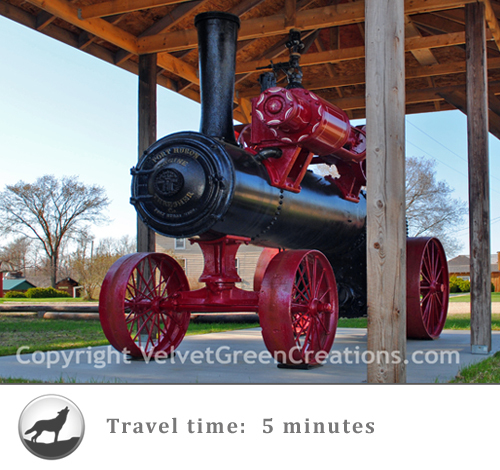 Here are some of our featured Things to See in and around the Newberry MI area. 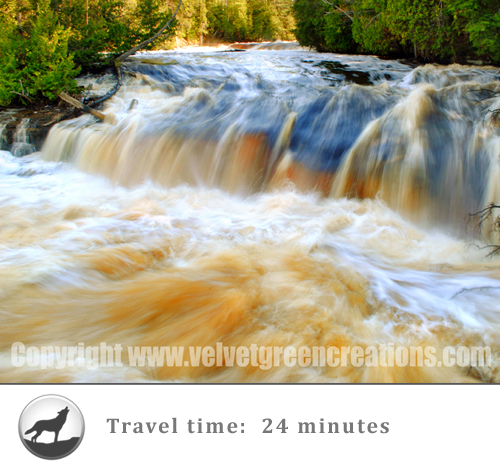 Our most beautiful of Upper Peninsula attractions is the Upper Tahquamenon Falls. 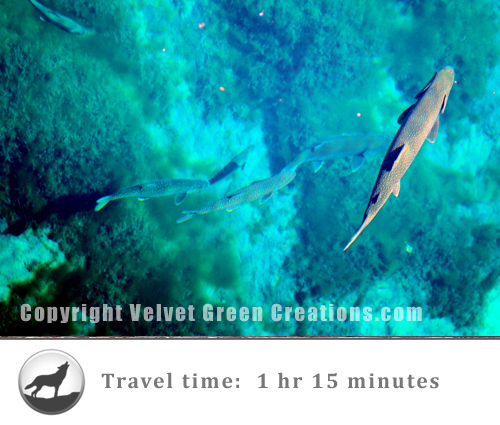 It is set within a pristine wilderness and is over 200 feet wide and 48 feet high. An impressive 50,000 gallons of water spill over this incredible waterfall per second. Seasonal precipitation can increase or decrease this amount significantly with springtime being a great time to see it at its peak. A magnificent walk path will direct your way through the forest within the Tahquamenon Falls State Park. The Tahquamenon Falls Park is open all year round and the Upper Tahquamenon Falls are particularly beautiful during the winter - as seen in the adjacent photo. As you walk down the beautiful trail, you will begin to hear the growing sound of water flowing over the Tahquamenon Falls. This is a family friendly attraction for guests of all ages. Please note that there are 94 steps down to the main viewing deck at the end of the walk. On the platform below there is a bench to sit and rest on while taking in the majestic views of the falls. The Tahquamenon Falls State Park offers a large array of activities such as birding, fishing, hiking, sight-seeing, camping, snowshoeing, cross-country skiing, and snowmobiling. Wildlife abounds throughout the Tahquamenon Falls and by chance you may see black bear, whitetail deer, and moose, along with a variety of birds. 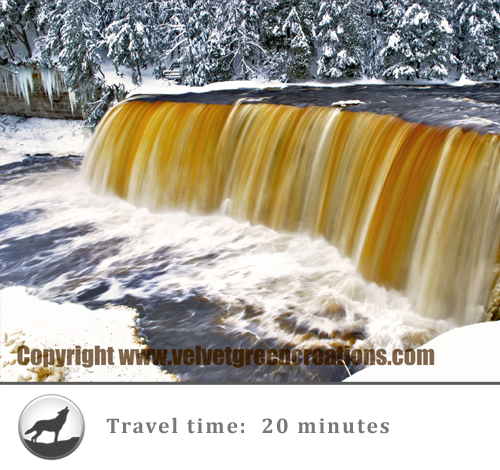 Located just 4 miles north of the Upper Falls is the Lower Tahquamenon Falls. Here you will experience a very unique place with many small waterfalls that cascade around an island. There are boat rentals available at the Lower Tahquamenon Falls along with a seasonal concession stand. Many visitors come here to wade in the water and shoot the small falls. People come here in droves to escape the hot and humid weather. It has become known as "Nature's Waterpark" and guests of all ages enjoy the tranquil yet exciting atmosphere. This is a great opportunity to take photos and hike. Here you will find a four mile hiking trail that connects the Lower to the Upper Tahquamenon Falls. The Lower Tahquamenon Falls four mile hike to the Upper Falls is a great experience that entails a winding path along the Tahquamenon River. This is a long trail, please bring adequate clothing, food and water with you along this hiking excursion - because of the terrain, traversing the trail may take a while to accomplish. Oswald’s Bear Ranch is an outstanding Upper Michigan attraction for the entire family. This complex is the largest bear ranch in the United States. Since opening to the public in 1997, Oswald's Bear Ranch has grown in size and in bears. The ranch now has 29 black bears, 2 huge habitats and 2 smaller habitats. This allows visitors to explore the outside of the enclosures and see the bears in their natural environment. Oswald's Bear Ranch has 4 habitats that allow visitors to explore the perimeters and view these great live roaming bears. Platforms allow visitors to have a barrier free view of the bears. This is a great place to bring the family. Rescued cubs are brought here every year and they are always a joy to see. Area youth enter contests yearly to name these newborn creatures. Make sure to bring your camera and get your picture taken with the cubs! The Newberry Country Club is situated on 200 pristine acres in Michigan's Upper Peninsula. Our Northern Michigan Golf Course has been redesigned with new bunkers, lengthened holes and new tee boxes, thus adding length to the entire course. A golf course of unique variety for all levels of golfers situated in the beautiful Upper Peninsula of Michigan, located 45 minutes north of the Mackinaw Bridge. Upper Michigan’s Seney National Wildlife Refuge is located in Germfask Michigan, just a half an hour west of Newberry, MI. This is one of the most pristine nature refuges in the state. The Seney National Wildlife Refuge is one of Upper Michigan’s top tourist attractions with over 88,000 visitors every year. Visitors can enjoy: hunting, fishing, wildlife observation, interpretation programs, environmental education, photography, hiking, biking, canoeing, kayaking, geocaching, cross-country skiing and snowshoeing, birding, mushroom picking, and berry picking. 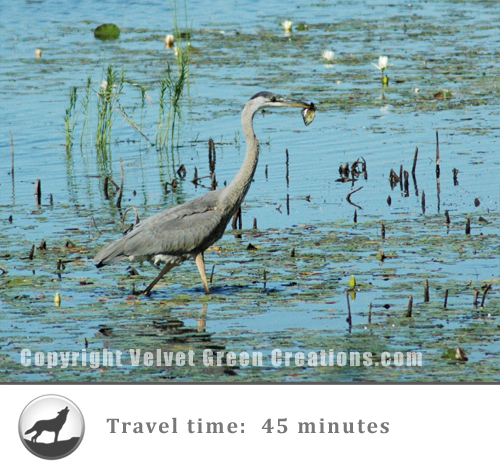 A variety of wildlife species can be seen throughout the Seney Wildlife Refuge. Currently, there are approximately ten pairs of common loons nesting each year. The refuge is also well known for the impressive numbers of sand-hill cranes that migrate back year after year. Their bugling can be heard throughout the refuge. Eagles, osprey, owls, and swans along with other bird species make Seney their seasonal home. 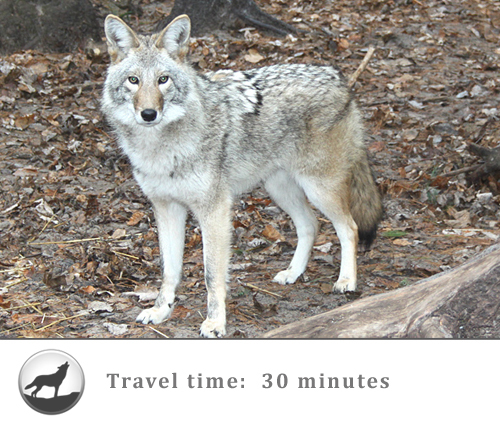 Wolves, deer, otter, bear, coyote, and moose also find their place here and thrive throughout the 95,238 acre refuge. The Tahquamenon Logging Museum and Nature Study, located just 1 1/2 miles North of Newberry Michigan, invites you to come to their museum and park to explore the original buildings and memorabilia from lumberjack days of the past. Come and see the original C.C.C. buildings full of old photos, models and original logging equipment. Eat a real lumberjack's breakfast in the Authentic Cook Shack made over a wood stove with home made care and goodness. Stroll along the boardwalk and nature trail and see part of the Tahquamenon Forest. The Tahquamenon River is nestled along this beautiful trail, where blue herons, ducks, birds and other wildlife abound. 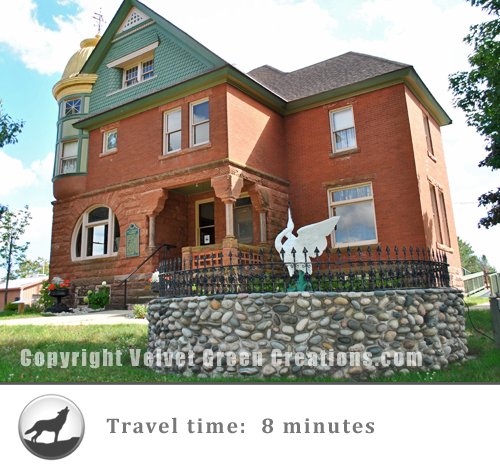 Constructed in 1894, the Luce County Historical Museum is located at 411 West Harrie Street in Newberry, Michigan. This State and National Historic site is a must see for all ages. The Luce County historical Museum is constructed of Jacobsville Sandstone and was designed by architects Lovejoy and Demare. Here you will find a great collection of Luce County History, the old jail and sheriff's residence, maps, pictures, along with other valuable artifacts. Admission is free, donations are appreciated. 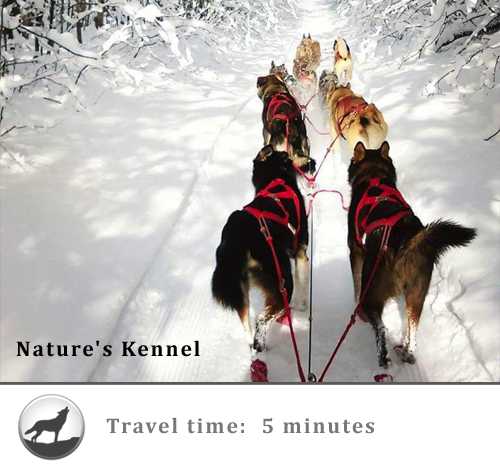 Nature's Kennel offers guided sled dog trips that give you the opportunity to drive your OWN dog team on a 10 mile loop, 20 mile loop, overnight or to ride along with a friend. These trips are all family friendly and great for all ages. 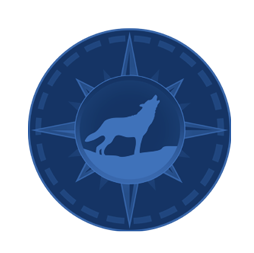 Each trip also includes a kennel tour, brief instruction and a guided sled dog adventure. Since 1849, the Whitefish Point Light Station has been a working life-saving beacon for traveling ships on Lake Superior. It is the oldest working Upper Michigan lighthouse on this lake. The legendary Edmund Fitzgerald steamer sank just fifteen miles northwest of this light house in 1975. The Whitefish Point Light Station's tower remains working and standing today. The Great Lakes Shipwreck Museum is located at Whitefish point and is open May through October. Founded in 1975, this non-profit organization offers a glimpse into the rich history of Lake Superior. The Great Lakes Shipwreck Museum has a large collection of information and historical relics from shipwrecks including the famous Edmund Fitzgerald. There are 550 major shipwrecks throughout Lake Superior also known as gichigami, by the Ojibwe, meaning “big water”. Approximately 200 of these sunken ships lie within the area surrounding Whitefish Point. At the museum, guests can also check out the Shipwreck Coast Museum Store. 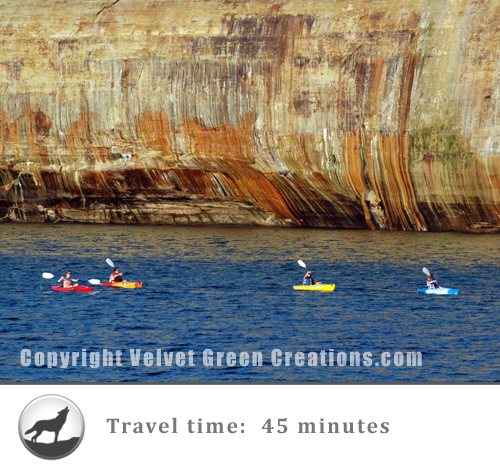 Pictured Rocks Cruises, LLC is an authorized concessionaire of the National Park Service Department of the Interior. For over 50 years, these summer cruises have been guiding visitors to the Pictured Rocks National Lakeshore. The boat cruises are 2 1/2 to 3 hours and will travel into and alongside the most visually stunning 40 miles of shoreline on the Great Lakes! They offer 3 distinct Michigan cruises: the Regular Cruise, the Spray Falls Cruise, and the Sunset Cruise. Each cruise departs from the Munising, Michigan City Dock. The crew will assist in ticketing, safety instructions, and other needs. 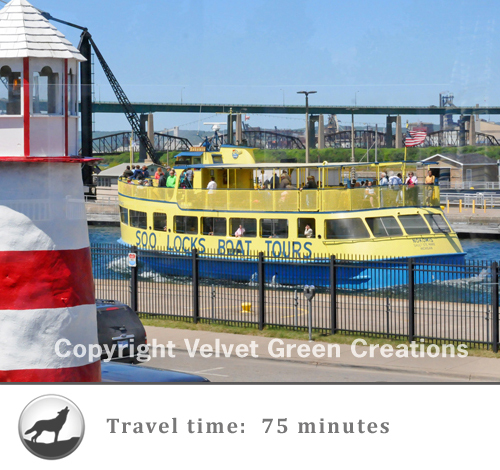 The day cruises are narrated by the captain and will inform you of a brief history of the tour boat, local area facts, and Michigan points of interest on this national park tour. Crisp Point was one of five Lake Superior U.S. Life-Saving Service Stations along the coast between Munising and Whitefish Point. 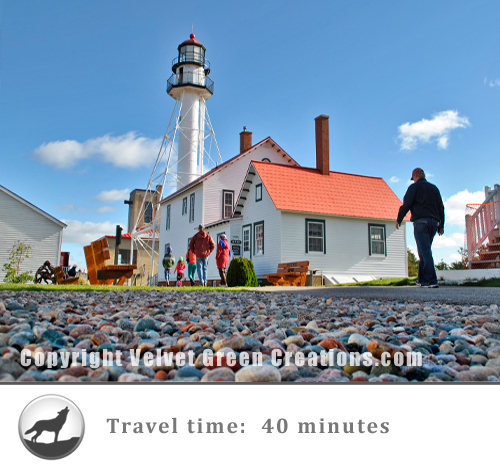 It is located about 14.5 miles west of Whitefish Point. It was built in 1875 and became operational in 1876 as Life Saving Station Number Ten, of the U.S. Life-Saving Service District 10 (it was later part of District 11) . Crisp Point inherited its name from one of the Life Saving Station keepers, an iron-willed boatman named Christopher Crisp. The other four Life-Saving Stations were Vermillion Point (now Vermilion, which is about 5 miles east of Crisp Point and became operational in 1876), Two Heart River (built 1876), Deer Park (became operational in 1876formerly Sucker River Station and Muskallonge Lake Station) and Grand Marais (built in 1899 and became operational in 1900). North Star Artisan breads contain only the finest ingredients and each loaf is naturally leavened, using all natural starter. Some of the breads are made with a wild yeast indigenous to the Upper Peninsula, all are made with crystal clear well water and contain no preservatives or chemicals. The bread dough is made with organically grown flour hand milled in a 50 year old hand-crank mill. The wood-fired brick oven, built by owner Paul. Pick up a loaf or two to take to your cabin or camp. You'll be back for more. Open May to mid-October from 10 - 6 pm, closed on Sunday. The Upper Peninsula has 10 gaming casinos for your entertainment. 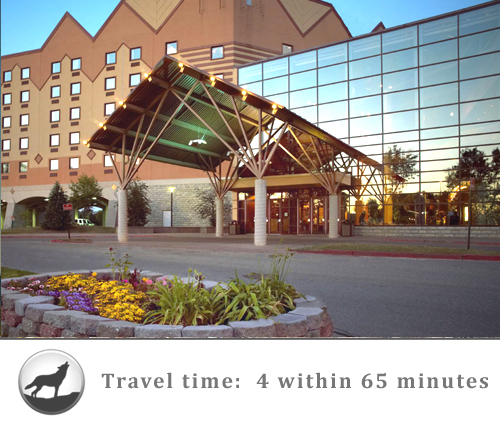 We are located within an hour of each of the following casinos. 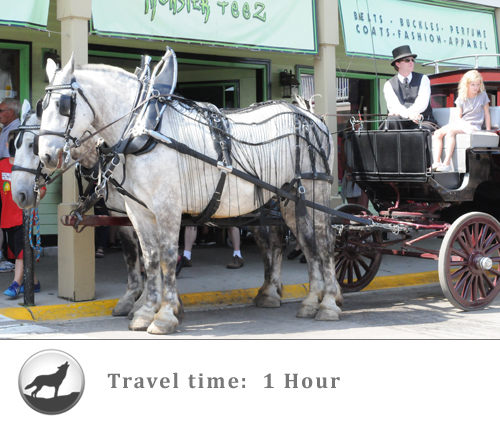 Visitors can experience Mackinaw City Things to Do and Things to See along with a wide range of Mackinaw City History. 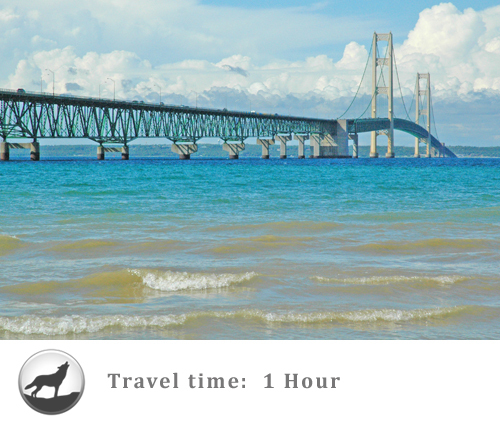 The Mackinac Bridge will greet you upon your journey while scenic vistas will amaze you throughout the Straits. If you are looking for the best places to stay in Mackinaw City, a vacation rich in history, entertainment and adventure, look no further, Mackinaw City is the place to be. 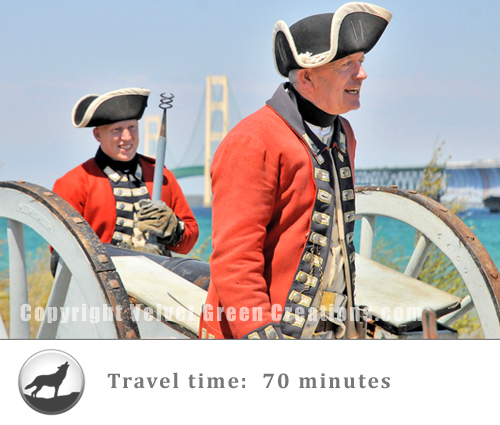 If you ever dreamed what it would be like to step back in time, Mackinac Island can make that dream a reality. 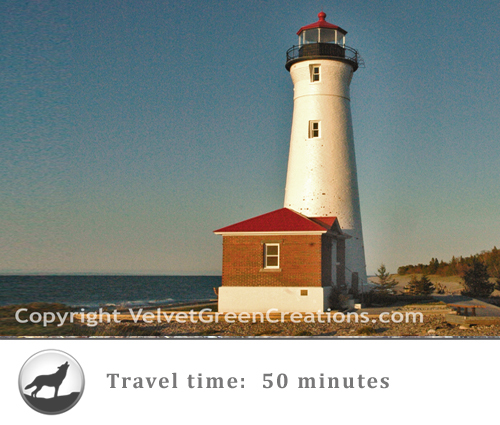 Located in Lake Huron, it served as a center for the Great Lakes fur trade back in the 17th century. No motorized vehicles are permitted on the island (accept for emergency vehicles). Transportation is made by horse, horse and carriage, bikes, roller-blades, and during the winter snowmobiles are permitted. As early as the late 19th century, Mackinac Island became a tourist attraction. The island has gone to great lengths to preserve and restore the forts, buildings, walls, churches, and other establishments. The entire Island is a National Historic Landmark. One of the most fascinating buildings on Mackinac Island is the Grand Hotel. Spanning the Straits of Mackinac, the Mackinac Bridge is the world's 16th longest suspension bridge and the 3rd longest in the Nation. It connects Michigan's Lower Peninsula and Upper Peninsula. Connecting city's are Mackinaw City and Upper Peninsula's St. Ignace. This incredible marvel was envisioned as early as 1880's. The completion and grand opening of the bridge was held on November 1st, 1957.